There’s an old African proverb you may have heard of: “It takes a village to raise a child.” Essentially, this means that in order for a child to grow into a well-rounded individual, they need the influence and support of many people in their life. Another interpretation is that it takes a lot of work to take care of a child, and so parents shouldn’t feel guilty about asking for help from others. While these are valid points to keep in mind when considering how best to raise your child, as parents, it is ultimately your responsibility to decide who those village members are and in what way they assist with raising your child. A babysitter, for example, is simply charged with the responsibility of keeping your child safe in your absence. A teacher has the responsibility of instilling important skills in your child. 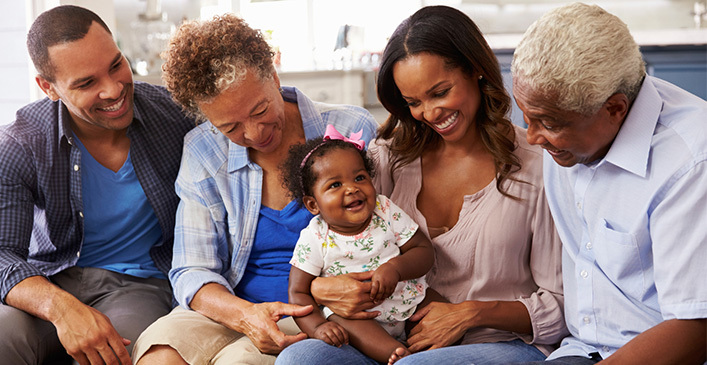 While the type of influence these types of people will have on your child is fairly cut and dry, the influence grandparents have is much more complex and can sometimes cause problems. Grandparents inhabit a position of authority that is similar to your own, but because it isn’t identical to the clout you have over your child, it can cause problems. Grandma might think it’s okay for her to discipline your daughter because she disciplined you that way. But she may not consider the fact that you want to discipline your daughter differently. Grandpa might think it’s okay to let your son watch a PG-13 movie at 11-years-old because he would have let you watch it at that age. But he doesn’t consider that you might have stricter rules about what movies you let your son watch. Suddenly you find yourself in a tenuous situation. Because your parents had authority over you, it only seems natural to them that they should have authority over your child. Approaching them about this matter is not always easy, but communicating to them about the issue is the only way both you and them will reach an agreement. Make it clear to your parents and parents-in-law as early as possible in your children’s lives how much or how little you will allow them to participate. Set realistic boundaries that won’t alienate them or make them feel unappreciated. Let them know what is acceptable and unacceptable in your household, and which things you expect to be reinforced in their household as well. While a lot of people live by the “my house, my rules” motto, find out exactly what those rules are before allowing your parents to watch the kids in their own home. If you’re uncomfortable with your children eating sugary snacks and processed foods, make it known to your parents. If you won’t accept spanking as an appropriate disciplinary tool, tell them you don’t approve of it. If they do it anyway, it’s time for a serious talk. When grandparents undermine the progress you’ve made with your child, it affects how they will react to those situations in the future. Consistency is the best way to teach children something and it doesn’t hurt to remind your own parents of that fact. While it’s inevitable your parents will sometimes get on your nerves — offering unsolicited advice, yelling at your kids, or however else they choose to interfere — it’s usually safe to assume their intentions are good. Most of the time, they are probably unaware of how they are affecting you, which is why it’s important to communicate. When they do something that bothers you, tell them, but with a smile. Come from a place of love and understanding and let them know you appreciate the thought behind the action, but that it’s not what you want. Instead, let them know how they can be helpful in a more productive way that’s closer to your own parenting goals. Are there some things your parents insist upon that you don’t like, but can let slide sometimes? Not everything that you disagree on should become an argument or is cause for concern. Fundamental things that affect the health and safety of your child should obviously be talked about in a serious matter. However, the occasional gift or extra half an hour of TV watching is not worth blowing a fuse over. It’s okay for grandparents to spoil their grandchildren a bit. Children should be taught to realize just how special their grandparents are and cherish the time they have with them. Better they enjoy themselves and actually want to visit, than have them throw a tantrum every time they’re off to Grandma’s, forcing you to call a sitter. Most importantly, your parents should work together with you and your spouse in a manner that you agree on. If they want to be more involved, figure out a way for that to happen that will still work for you. Let them know your rule is law with your kids, but don’t shut them out completely. Ultimately, grandparents just want to help, and that includes fussing over the kids and throwing in their two cents once in awhile. Sometimes it’s hard to remember that they actually do know what they’re talking about, at least on some level. They raised you, after all, didn’t they? If it’s obvious that certain things have changed since they took care of small children, educate them. Take them with you to the pediatrician or when you pick the kids up from daycare. The more they feel a part of the “village” the more likely they’ll respect your wishes and trust you to parent your kids the way you feel is right. LifeMix.today Copyright © 2019. All Rights Reserved.